Fiaz Rahman has had a rough six months. The 18-year-old developed a pressure injury in August that prevented him from going to school for months. Just before Christmas he was hospitalized at Holland Bloorview. "More than physically, it was emotionally painful, because I wasn't in control of it," he says. "I didn't intend for it to happen. It ruined my lifestyle. I couldn't enjoy my summer or go to school. It was difficult for my parents, and I couldn't hang out with friends. I felt trapped, isolated and lonely." While in hospital, Fiaz has pursued his love of art, and he has dozens of bright, bold, energetic pieces on display in his room. We spoke about his stay here. BLOOM: How has art helped you cope while in hospital? Fiaz Rahman: I've always loved art. I love media and I'm a poet. I love movies and colours and imagination. They're all a big part of my inspiration. Doing art here showed me a lot of things I didn't know I had inside me. It feels like I'm creating content for the world. You know how artists leave their mark and their legacy, and make a name for themselves? I like colours—constructing colours, colliding colours, obstructing colours. I want to create art as a business in the future, as a career. I want to go to the Ontario College of Art and Design. I like trying new things, and seeing what works, and what doesn't work, for me. I like making something better. BLOOM: Where did you do your art while here? Fiaz Rahman: I did some of it in recreation and some of it by myself in my room. BLOOM: I noticed you have some art gallery tickets on your windowsill. Fiaz Rahman: Dr. Flap, the clown, printed those up. I've tried to invite everyone and anyone. BLOOM: What has been the hardest part of being in hospital? Fiaz Rahman: I love this place. It's an amazing place. People need each other and we need to take care of each other. Kindness goes a long way. I've had a lot of support and I'm happy mentally and emotionally here. I still have my pressure ulcer, but it's healing and I'm so grateful. It's not as deep as it was. BLOOM: Do you have any advice for our staff? Fiaz Rahman: It's important for staff to understand where a child is coming from. Don't judge them. Understand and have empathy for them. You need to connect to the kids. 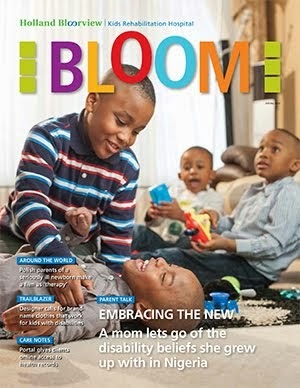 BLOOM: What advice would you give a child or teen who was coming to stay here? Fiaz Rahman: It's such a great facility. Speak to people here, and let them help you. Create new friends. Surround yourself with a positive environment. Try to find out what you're good at and explore your passions. It's going to be tough, so you have to be strong and patient. Fiaz, I must sound like a broken record at this point - but you're an amazing artist! Keep up your work, it is incredible :) Thanks for always coming to the Family Resource Centre to say hi while you were here. You're always welcome to come back and we'll miss you around here! Well Done my friend Fiaz! When I read this article it is true, Holland Bloorview is the best place to do rehab youth and children. Every time I visit it feels like a second home to me. This article is well done and the service is excellent.I agree with you!